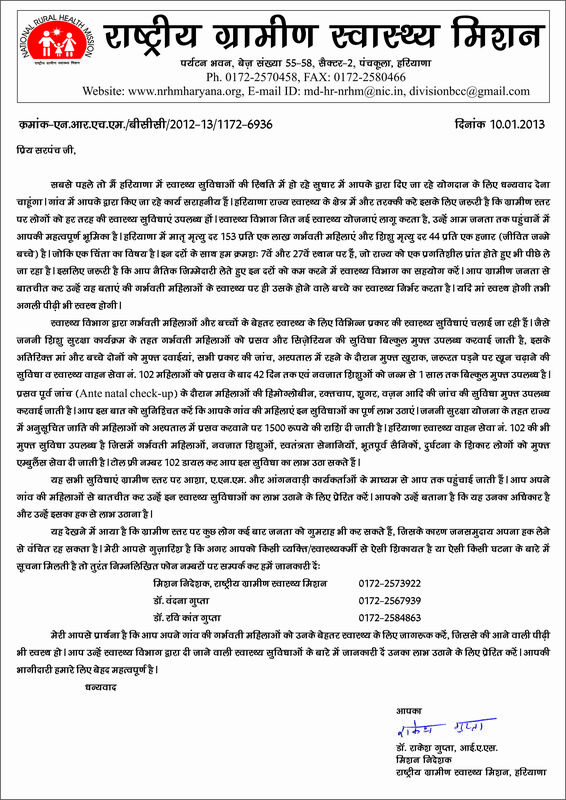 Subject:- Reconstitution of District Health & Family Welfare Society, Haryana. Reference this office letter No. 3/7-EC-IV-2003/1020-38 dated 24/9/03 vide which Memorandum and Constitution of Distt. Health & Family Welfare Societies was sent to you for registration. As envisaged under NRHM, to support the Distt. Health Mission, and integrated Distt. Health & Family Welfare Society is now reconstituted. The Distt. Health Society shall be responsible for Planning & Managing all Health & Family Welfare Programmes in the district both in rural as well as in urban area. The society shall ensure Inter-Sectoral Convergence, an integrated planning should be a specific task for the Governing Body. A copy of the Revised Memorandum & Re-constitution of Governing & Executive Body of Distt. Health & Family Welfare Society is enclosed for necessary action at your end. 3. All Programme Officer of the directorate. Re-Constitution of District Health & Family Welfare Society, Haryana. The National Rural Health Mission emphasize to provide effective health care to the rural population, especially the disadvantaged groups including women and children, by improving access, enabling community ownership and demand for services, strengthening public health systems for efficient service delivery, enhancing equity and accountability and promoting decentralization. As envisaged under NRHM Ministry of Health & Family Welfare Govt. of India that the State level Mission would function under the over all guidance of the State Health Mission headed by the Chief Minister of the state. The function under the Mission would be carried out through the State Health & Family Welfare Society. Accordingly, the State Govt. had constituted the General Body of State Health Mission under the Chairmanship of Hon’ble Chief Minister Haryana vide notification dated 27/06/05. The functions under the Mission would be carried out through the State Health Society, Haryana, Panchkula. On the lines of the State Health Mission, every district will have a ‘District Health Mission’ headed by the Chairperson, Zila Parishad. It will have the District Collector as the Co-Chair and Chief Medical Officer as the Member Secretary. The District Health Mission has already been notified vide Govt. Notification dates 10/02/2006(Flag ‘A’). It is therefore proposed that the District Health & Family Welfare Society, of NRHM may also be re-constituted. The Society shall comprise of Governing Body & Executive Committee. To support the District Health Mission, an integrated District Health Society (DHS) and all the existing societies as vertical support structures for different national and state health programmes will be merged in the DHS. The DHS will be responsible for planning and managing all health and family welfare programmes in the district, both in the rural as well as urban areas. There are two important implications of this requirement. Firstly, DHS’s planning will have to take note of both treasury and non-treasury sources of funds, even though it may not be handling all sources directly. Secondly, its geographical jurisdiction will be greater than those of the Zilla Parishad and /or Urban Local Bodies (ULBs) in the district. Ensuring Inter-sectoral convergence and integrated planning should be a specific task for the Governing Body of the DHS. However, the DHS is not meant to take over the executive functions of the ZP / ULBs and/or the district health administration. On the contrary, DHS is meant to provide the platform where the three arms of governance – ZP, ULBs and district health administration and district programme managers of NRHM sectors get together to decide on health issues of the district and delineate their mutual roles and responsibilities. The DHS may also be viewed as an addition to the district administration’s capacity, particularly for planning, budgeting and budget analysis, development of operational policy proposals, and financial management etc. Because it is a legal entity, the DHS can set up its own office which has adequate contingent of staff and experts and can evolve its own rules and procedures for hiring the staff and experts both from the open market as well as on deputation from the Government. · District Welfare Officer for SCs/BCs. · Any other member deemed to be necessary as decided by chairperson with a view to associate Civil Societies Groups working in the area of health. The Society shall assist District Health Administration in the implementation of various health programmes and projects in the district with special emphasis on priority sectors like Reproductive and Child Health, implementation of health programmes and National Rural Health Mission (NRHM) in the district, Population Control, Control of Malaria. TB & Leprosy and Prevention of Blindness and Malnutrition etc. The meeting of Governing Body of District Health & Family Welfare Society,­­­­­­­­­­­­­­_________ will be held every 3 months & earlier, if necessary. Ex-officio members shall be permanent members of the society. The term of other members will be for 2 years. · Approval of Annual District Plan for the NRHM. · Consideration of proposals for institutional reforms in the Health Sector. · Inter-Sectoral coordination: All NRHM related sector and beyond eg. Administrative Reforms across the district. · Status of follow up action on the decisions of State/ District Health Mission. · Co-ordination with NGOs/ Donor/ other agencies/ organizations. · Any other issues with permission of Chair. Ø To act as the nodal forum for all stake holders –line departments, PRI and NGOs- to participate in planning, implementation and monitoring of the various health and family welfare programmes and projects in the district. Ø To receive, manage and account for the funds received from the State Government (including State level Societies in the health sector) for implementation of Centrally Sponsored Schemes in the district. Ø To strengthen the technical / management capacity of the District Health Administration through recruitment of individual / institutional experts from the open market. Ø To facilitate preparation of integrated district health development plans, for health and its various determinants like sanitation, nutrition and safe drinking water, etc. Ø To guide the functions related to ‘Total Sanitation Campaign’ at the District level. Ø To mobilise financial and non-financial resources for complementing/supplementing the health and family welfare activities in the district. Ø To assist hospital management societies in the district. Ø To undertake such other activities for strengthening health and family welfare activities in the district as may be identified from time to time, including mechanisms for intra and inter-sectoral convergence of inputs and structures. i) Consider and approve the annual District Action Plan(DAPs) & District PIP . iii) Make, amend, or repeal any bye laws relating to administration and management of the affairs of the Society subject to the observance of the provisions contained in the Act, provided that such amendments are brought to the Governing Body after obtaining endorsement / approval from the State Government. iv) Consider and approve the audited accounts of the society. vi) Issue policy guidelines/ directions to the Executive Committee with regard to implementation of the various health activities & programmes. vii) Approve formation of various groups/sub committee for various purposes related to the implementation or monitoring and delegate suitable powers to such groups/sub committees. viii) To make authorization to the Member secretary of the Governing Body or to any other office bearer of the Executive Committee to sue or defend the Society in legal affairs and sign documents or plaints submitted in courts on the behalf of the society. ix) To approve byelaws relating to service matters administration and financial matters of the society on the recommendation of the Executive Committee. x) To ensure the mandatory meetings of the Executive Committee or sub-committee/expert groups whenever constituted are held and the minutes of the meeting are recorded and maintained. xi) To ensure that in the Tripartite Review Meeting the following documents are placed- (a) Audited Accounts for the preceding financial year (b) the updated physical and (c) financial progress of the project and the plan of action for the ensuing year. xii) Accept donations and endowments or give grants upon such terms as it thinks fit. xiii) Develop and adopt its own rules and regulations for recruitment and appointment of experts and administrative / technical staff and set its own compensation package for such experts / staff to be recruited from the open market and/or deputation basis. xiv)Do generally all such acts and things as may be necessary or incidental to carrying out the objectives of the Society or any of them, provided that nothing herein contained shall authorize the Governing Body to do any act or to pass any bye-laws which may be repugnant to the provisions hereof, to the powers hereby conferred on the Governing Body and other authorities, or which may be inconsistent with the objectives of the Society. The Executive Committee would ensure execution of integrated NRHM District Action Plan, follow up action on decision of State/District Health Mission. The meeting of Executive Committee of State Health Society, Haryana will be held every month & earlier, if necessary. · Detailed expenditure and implementation review. · Approval of proposals from PHC/CHC/ Sub-Centre and other implementing agencies/ District Action Plans. · Execution of the approved State Action Plan/ DAP, including release of funds for programmes. · Finalization of working arrangements for intra-sectoral and inter-setoral co-ordination. · Follow up action on decisions of the Governing Body of State Health Mission/ District Health Mission. · Training & Capacity of all Medical Officers, Staff Nurses, Paramedics & other stake holders as envisaged in the DAP. · Strengthening of District Training Centres. · HR Planning, Development & Employment. · Any other issues related with the permission of Chair. i)To prepare the NRHM Programme Implementation Plan (PIP) & Annual District Health Action Plan for approval by the Governing Body of the Society. ii) To make appointments to various posts/position approved by the Governing Body. iii) Scrutinize annual plans and the budget proposal placed before it by the Member Secretary and ensure that it should reflect all activities, provisions for each activity, anticipated receipts and payments out of the fund of the Society, and summit them to body for approval. iv) To formulate bye-laws on administrative and financial matters and submit to the Governing Body for approval. v) Approve appointment of the auditor for the annual statutory audit of accounts of the society in accordance with bye-laws. vi) Constitute sub-committee for different activity under the project. vii) Review the working/functioning of sub-committees constituted by the Governing Body or the Executive Committee as per laid down norms and guidelines for each of them. viii) To issue guidelines/directions to the Member Secretary for proper administration of the funds of the Society. ix) To take all necessary steps to ensure proper execution of the plan, scheme or activity approved by the Governing Body. x) To undertake any activity or function or liability delegated or entrusted by the Governing Body of the Society from time to time.